Leslie Model 251 | MOSweb Online! This cabinet’s amplifier is a 2 channel tube type chassis with 2 x 6550 finals in the rotary channel producing 35 watts, and 2 x 6973 finals in the stationary channel producing 20 watts. The 251 was designed for use with Conn organs, but like the other “Conn” cabinets, it can be attached to almost any dual channel organ with the appropriate connector kit. It cannot, however, be used with a stereo organ as the cabinet has one rotary channel and one channel speaking through a pair side mounted 6×9 stationary speakers. 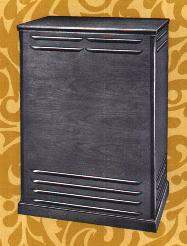 This cabinet replaced the 51 and 51C and introduced 2 speed operation (Tremolo and Chorale).